The trust and the unity that the lovers have gives each of them confidence and strength, empowering the other. 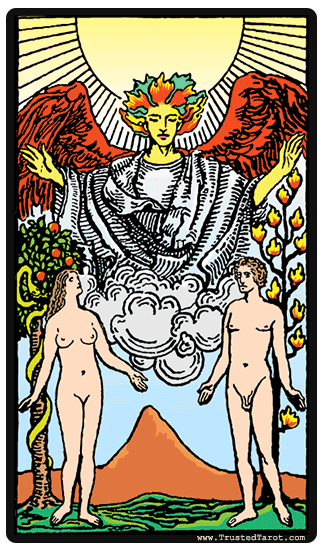 Another meaning behind the lovers card is the concept of choice - a choice between things that are opposing and mutually exclusive. This could be a dilemma that you need to think about carefully and make the best decision for your situation. A more personal Lovers meaning that can apply to individuals is the development of your own personal belief systems, regardless of what are the societal norms. We see this as a development from the Hierophant, who made decrees and passed on his knowledge through a standardized system. This is one of the times when you figure out what you are going to stand for, and what your philosophy in life will truly be. You must start making up your mind about what you find important and unimportant in your life. You should be as true to yourself as you can be, so you will be genuine and authentic to the people who are around you. The Lovers reversed can point to both inner and outer conflicts that you are dealing with. The disharmony can make daily life difficult and could be putting pressure on your relationships. You should take time to think about what you are punishing yourself for, so you can fix them or let them go. At this time, you should also think about your personal values and belief system to make sure that they are aligned with what you want from your life. A break in communication could be another possible interpretation. The foundation for your relationships may be cut off, creating an imbalance between you and your partner or loved ones. The unity normally present within the card has become lopsided. The Lovers reversed can also indicate that you have been avoiding responsibility for your actions. You could have made a decision that was based on your desire for immediate gratification but are now blaming others for the consequences that are catching up to you. So, you need to make amends or let go of the past and make better decisions in the future.